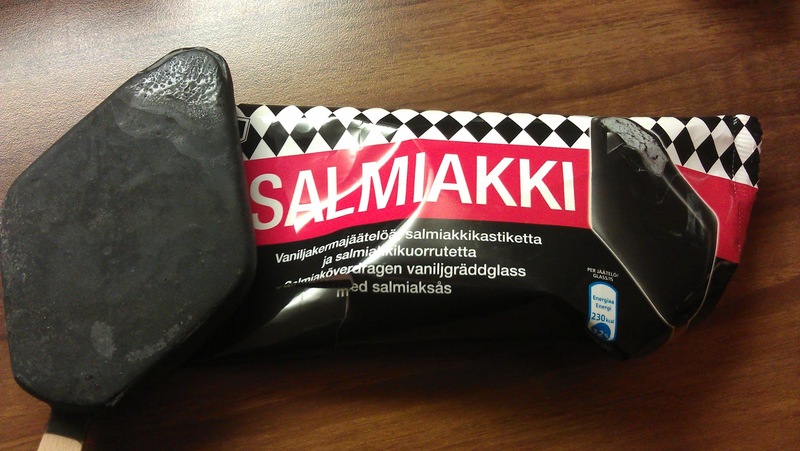 Salmiakki - a foodstuff so loved by Finns and Scandinavians, it's hard to think that many people in the UK have never heard of it. Fortunately for me, I have. I've been a big liquorice addict since my Mum bought me sickly sweet panda sticks to chew on, in the vain belief they were healthier than sweets, just because the health food shop sold them. Over the years I moved on to harder stuff - the catherine wheels with their brightly coloured centres, the Bassets sticks so hard you can chip a molar on them and finally on to liquorice root. A chance encounter with a Finnish Landscape Architect on a train to Liverpool (true story) introduced me to the wonder than is Salmiakki - or salty liquorice as it's known (or as it's easier to pronounce!). 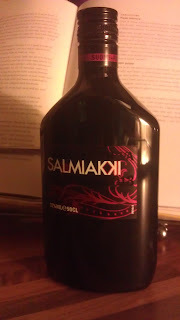 Salmiakki and vodka - what perfect combination! Salmiakki isn't just liquorice and salt, it's actually flavoured with aluminium chloride - hence the moniker, a take on sal ammoniac, which is the chemical's Latin name. The addition of the chloride has been described as 'like licking the sea' 'stinging' and 'tongue stripping' amongst other things. It's definitely an acquired taste, I'm just happy I acquired it. I'm actually a huge fan, something that tickles my Finnish friends as they're not used to Brits liking this - indeed our first night in Helsinki was rounded off by them buying us salmiakki shots and laughing to themselves as they expected us to spit it back out. They weren't too pleased when I a) already knew what it was (thanks Finnish Landscape Architect) and b) really enjoyed it, ordered another round and beat them in a drinking competition. Whoops. Visiting or living in Finland you see there's more than just salmiakki in vodka and chewing gum - it's in ice cream, chocolate, drinks, sweets and probably lots of other things I don't realise because I don't read Finnish very well. If you're in Helsinki, pop along to the little coffee hut on the lush green corridor of the Bulevardi and pick up a salmiakki cone, the cream sweetness balances out the salt perfectly. However if it's the middle of winter with a thick blanket of snow of the ground then you can just pop in to the local supermarket and pick up a salmiakki ice lolly - yes indeed - but unless you're a salmiakki addict this might be a step too far, as for me this gets overpowering and almost tastes like licking hair dye once you're about half way through. There's a lot to be said to the astringent salty tang, especially when paired with the milky sweetness of chocolate - we had a brilliant dessert at Mami in Turku, which paired chocolate ice cream with salmiakki sauce and toffee shards - inspired. So much so I've created my own Salmiakki sauce at home, so I can recreate this pudding and many others like it. I started off using Signe Johansen's (Scandilicious) recipe for salmiakki caramel - which includes melting down salmiakki sweets and adding them to the caramel recipe. However I'm not very patient and these took forever, plus they didn't yield the right flavour for me, so I reverted back to my Mum's recipe for caramel (which is actually my grandma's and could actually be my great-grandma's) and then popped in salmiakki vodka and some salt to get the right taste. 8. Enjoy over ice cream or on bananas or with chocolate mousse - or however you fancy it! 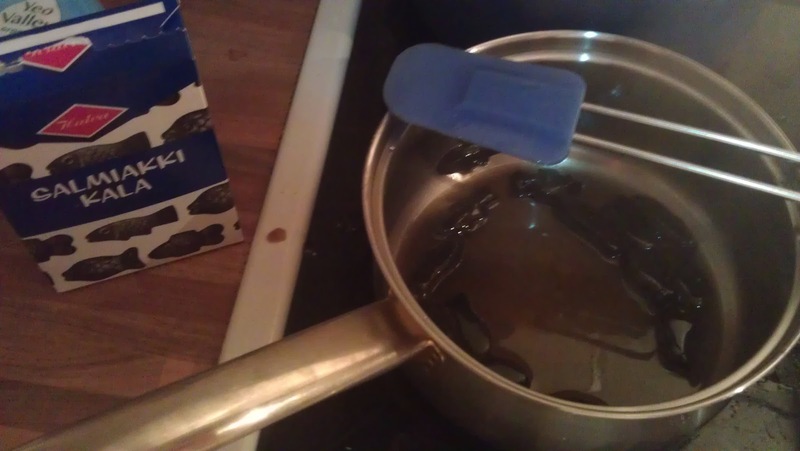 NB - the sauce will keep in a jug in the fridge (covered) for about two weeks, but will solidify a bit, so you may have to take it out a long time before you want to use it and then pop it back on the heat for a minute or so. 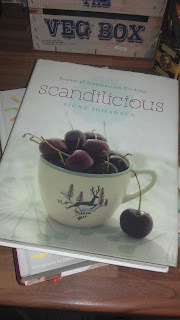 I'm an ex-pat Briton documenting her move to Helsinki with the food I find and the things I eat, plus the mishaps I make!